The highlight of the annual Food & Wine festival is the spirited silent and live auctions, which feature luxurious wine and fine dining packages and exclusive experiences. All proceeds go to benefit Montalvo and its art and education programs. You can peruse last year's packages below to gain a sense of the type of packages featured at our auction. Stay tuned for the announcement of our 2018 offerings! A delicious dinner in an unparalleled setting! Enjoy a spectacular meal for eight at sunset with Peter Thompson, owner of Andrew Geoffrey Vineyards, on his outdoor, three-level, 1,000-square-foot redwood deck atop Diamond Mountain in Napa Valley. Peter will be your personal chef and sommelier for the evening, as you sample a country-style dinner of grilled specialties and a vertical tasting of the Andrew Geoffrey Diamond Mountain District Cabernet Sauvignon. You will also receive a signed three-liter bottle of 2007 Andrew Geoffrey Cabernet Sauvignon. This auction item is the all-time favorite of Montalvo’s Food & Wine bidders. Past winners of this item rave about the venue, the wine, the cuisine, and Peter Thompson’s gracious hospitality! Valid May 1 through October 31, 2018. ​Take in the best view in Saratoga while enjoying an exquisite VIP dinner and wine pairing at the award-winning House Family Vineyards. Proprietor, Dave House, and his wife, Devyani Kamdar, will invite 12 lucky guests into their spectacular home perched on a ridge above Saratoga, for a very special “vine to table” dinner on November 5. The evening will begin in the House Family Vineyards Tasting Room, where you’ll sip wine and gaze at panoramic views of the Santa Clara Valley and the Santa Cruz Mountains. You’ll then stroll over to the house—designed by famed architect Goody Steinberg—for more wine and a four-course dinner prepared by Dave’s private chef, Suzy Brown. Dave will personally pair each course with House Family Vineyard wines, including his award winning Estate Chardonnay and Estate Cabernet Sauvignon; both made entirely from grapes grown in the vineyards steps from the dining room. Stars will twinkle above and the lights of Silicon Valley will glitter below. This rare experience is not to be missed! Impossible to buy except at auction, this mixed case of Kosta Browne Pinot Noir will allow you to taste how great wine changes as it ages. Stored since release in the private temperature controlled cellars of Russell Perry and Paul Conrado, these bottles were purchased directly from the winery. Of the twelve bottles of wine; nine scored 92 points or higher by Robert Parker. They feature four vintages (2011–2014); and three Pinot vineyards: Russian River, Sonoma Coast, and Santa Lucia Highlands While these bottles individually are valued at auction at around $900, this 4 x 3 vertical/horizontal has never been offered to the public and is worth much more. To top it off, enjoy a tour and VIP tasting for six at Kosta Browne Winery, an exclusive, boutique winery located in Sebastopol that is rarely open to visitors. FOUR HOUSES, FOUR WINERIES, OAK & RYE: A HALLOWEEN PARTY FOR GROWNUPS! 40 lucky bidders will gather two days before Halloween to stroll through the historic Almond Grove District of Los Gatos. In the lovely crispness of late October, guests will begin at the 1915 bungalow of Pat and Earl Charles for a glass of award-winning Mount Eden Vineyards Chardonnay (poured by winemaker Jeffrey Patterson) and a gorgeous hors d’oeuvres display crafted by Montalvo Culinary Artist Andrea Blum. Next, stroll to the home of Timi and John Sobrato for Oak & Rye’s famed shaved Parmesan and Brussels Sprout Salad accompanied by Kathryn Kennedy Winery wines—and yes, Marty Mathis will be there to pour! Visit Timi’s artist’s studio while you sip. Then, walk up to Carol and Peter Sandman’s lovingly updated 1950’s home for Oak & Rye’s gourmet pizza slices hot out of their movable pizza oven, accompanied by wines from Saratoga’s Big Basin Vineyards, presented by winemaker Bradley Brown. Guests will finish the evening by walking down Tait Avenue to view the street’s famous Halloween decorations before arriving at the craftsman-style home of Gretchen and Matt DiNapoli for autumn desserts and hot cider. Plus, Karen Bria, Food & Wine’s own Wine Chair, will be pouring Champagne Taittinger and Fonseca Vintage Port. This fall, you and 15 of your closest friends (or clients!) will get to see the San Jose Sharks go head to head with their arch rivals, the Los Angeles Kings, from the luxurious vantage point of an upper bowl level penthouse suite! Boasting excellent sight lines, the suite also comes fully furnished with HD televisions and will be catered with $500 worth of delicious food and an extensive wine and beverage selection. You will even have suite service attendants and a dedicated concierge staff to make sure your experience is exceptional. Also, enjoy four parking passes, and take home a Brent Burns bobble head. There is no better way to experience the rush of the game! An evening not to be missed! 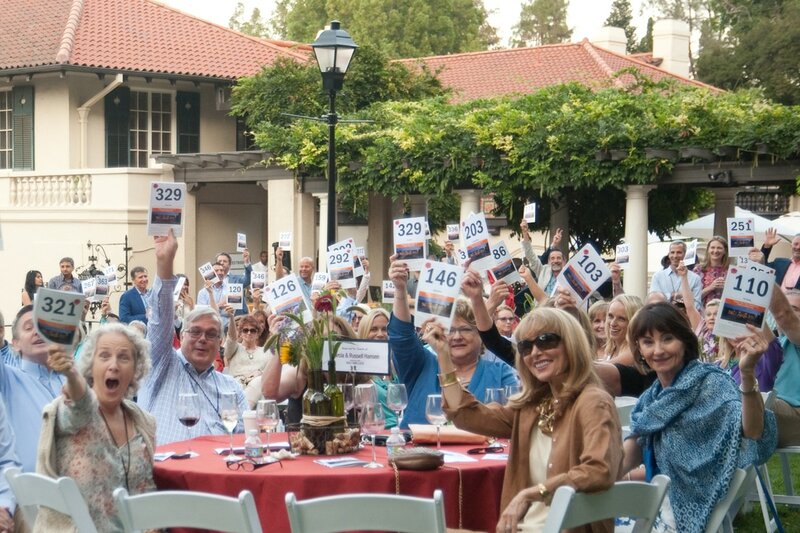 30 winning bidders will enjoy a very special treat: Los Altos Hills neighbors Kathleen and Mark Santora and Steve Finn will open up their homes for an out-of-this-world progressive dinner, prepared by everyone’s favorite chef, Scott Cooper of Le Papillon. The afternoon will begin in Mark and Kathleen’s lovely, tree-lined terraced garden with hors d’oeuvres and champagne. We will then stroll over to Steve’s to “progress” through appetizers, dinner, and dessert in three stunning locations across his three-acre estate. Explore the historic 1902 property featuring stunning views of the Valley, and take a peek at the vintage and muscle car collection hiding in the “barn.” 95+ point wines will accompany the repast. Relax after dinner with whisky, cigars, and after-dinner cordials. ​This exquisite evening will begin with your party of eight being picked up by limousine for the drive to Charmaine and Dan Warmenhoven’s Monte Sereno home, where you will choose between the sublimely beautiful pairing of exquisite champagne and delectable caviar, or opt instead to sample over 125 different single malt Scotch whisky varieties. While the focus will be mostly on Highland and Speyside single malts, you will also sample Islay, Lowlands, and Campbeltown whiskys. The whisky tasting will include several “Scotch Whisky of the Year” winners and several verticals—including twelve different Macallans and eight different Glenmorangies. After savoring excellent drink, delicious hors d’oeuvres, and sparkling conversation, the limousine will whisk you all home. Valid October 1, 2017 through October 31, 2018. Three-time Grammy-nominated pianist David Benoit is a former Lucas Artists Fellow, who has spent time in residence at Montalvo composing work. He has collected these pieces into his brand new album The Music of Montalvo—and you will be there to celebrate its official Bay Area release at a private pre-Valentine’s concert by David in the historic Villa! The evening will begin with a lavish pre-concert reception exclusively catered by Le Papillon and served on the second floor of the Villa, an area many never see. Guests will sip wine in the cozy Loggia that runs along the second floor of the Villa overlooking the Oval Garden and Spanish Courtyard. This is where the famous artists who perform at Montalvo are served dinner before their performance. You’ll be able to step out onto the balcony overlooking the Great Lawn and view the famous stained glass window at the top of the grand staircase. David will then work his incomparable piano magic in the Main Hall and join us for a sumptuous dessert buffet, cordials, and coffee afterward. Plus, each guest will go home with an autographed copy of The Music at Montalvo at the end of the evening. YOU CANNOT BUY THESE TICKETS ANYWHERE ELSE! This once-in-a-lifetime opportunity includes two daytime passes in the spectacular President’s Suite during the first week of the 2018 U.S. Open. These passes are not available for sale to the public and are issued only by invitation from the President of the USTA. You will rub elbows with family members of competitors and VIP guests such as Beyoncé, Bradley Cooper, Anna Wintour, Ben Stiller, Alec Baldwin, Jewel, Vera Wang, Emeril Lagasse, and Martina Navratilova. The winner of these daytime passes is entitled to access to two seats in The Presidents Box at Arthur Ashe Stadium, free lunch in the formal VIP dining room, access to air-conditioned VIP lounges, and a swag bag of souvenirs to take home. Best of all, you will be greeted by famed photographer Jeanne Moutoussamy-Ashe, widow of Arthur Ashe, and a past Montalvo Artist Fellow. For one day use during Week 1 (August 27-31) only. Non-transferable. Please note that these invitations to the President’s Suite may not be posted for resale or auctioned off in newspapers or on the internet. It just doesn’t get more exquisite than this! Join us for an unforgettable evening at Russell Perry’s gorgeous home. Nestled atop a hill in the beautiful Saratoga Foothills with a view from the deck of Mount Eden Vineyards, this beautiful Napa Valley-style home sits on more than an acre, overlooking the private, “Old Tractor Vineyard.” Chihuly chandeliers welcomes guests in both the entry foyer and dining room, where guests will enjoy a peerless three-course dinner, personally prepared by legendary chef David Kinch whose Los Gatos restaurant Manresa is one of only six West Coast restaurants honored with three Michelin stars. And as if all that weren’t enough, enjoy each course with a different 100-point wine from Russell’s private cellar. It will be an evening of culinary excellence that you’ll never, ever forget!